I particularly enjoyed the location of this site. As you walk down the track towards the stone pair you can see the mountains of north Mayo across the bay. The high cliffs on Achill are more prominent than this wide angle shot suggests. The stone pair look quite odd as they are set some distance apart. It has been suggested there may have been a third stone between them. 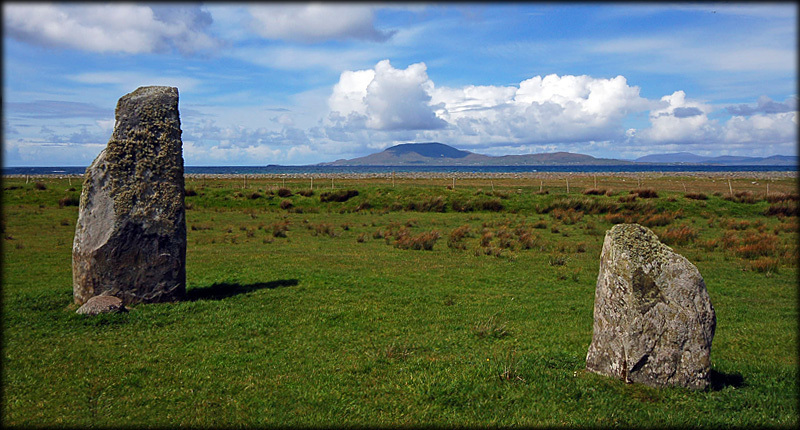 Although the stones may seem to align with Croagh Patrick, which can be seen in the distance if you look west, it is thought the stones may align with the setting sun over Inishturk. There are a number of megalithic sites dotted around this part of Mayo and I would love to spend more time exploring the surrounding area. Situated: From Louisberg take the R335 south for 6 kilometres. At Cregganbaun take a right turn for Killeen. Drive to the end of this road and take a right at Killeen. Go straight through at the crossroads, take the next left (Clapperbridge signposted right). Drive 400 metres till you come to a track on the right, park here and walk down the track for 150 metres the stones are in a field on your left. Discovery Map 37: L 7446 7586. Last visit May 2009.